An little square I made using a Heather Bailey pattern and some AB Ginger Bliss, an adorable baby mouse(-ish looking animal) that a sweet friend from Thailand gave me during college, and big store bought tomato I've had since college. I've never been able to stick pins in the little mouse. It's a little too voodoo to me, but I love it and it reminds me of my friend, Sudurampai, who I haven't seen since I graduated. 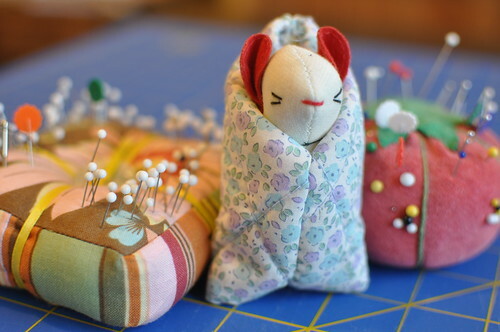 But yesterday, I saw this pincushion on Anna Maria Horner's blog. I want one of those!! I've been looking online for a pattern, but I can't find anything similar. Everything I find with a cup is either in a teacup or made to fit around a mug. Does anyone know what this type of pincushion is called or have you seen a pattern? I'm just dying to make one of those! I can help you with that question. You can get the pattern from her first book, Seams To Me. Happy Sewing!